NME is reporting the Astoria's last night will be 15 January, while the Metro Club has also confirmed it's closing its doors in January. Less than a month away! At the beginning of the year we were thinking we could have the venues for another couple of years, but Compulsory Purchase Orders were served on 13 buildings around Tottenham Court Road in October and it seems landlords have thrown up their hands and realised fighting was pointless. While we like Crossrail (who could object to the prospect of whizzing through central London? 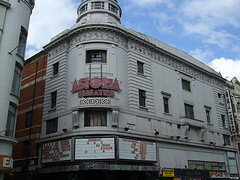 ), we do rather wish the Astoria could have been saved (rather like we were promised back in 2004). Festival Republic haven't confirmed closure dates yet, but their website shows that some gigs are being moved to other venues. The New Years Eve bashes at the main venue and LA2 (where Noah and the Whale play live) are still going ahead. The Metro's owners are far more vocal about their disappointment. In a press release they lambast TfL for only giving 28 days' notice and the impossibility of finding a new venue over the Christmas period. Many gigs that were lined up have had to be cancelled. The Metro's last night will be Blow Up on Saturday 17 January. They've also published a photo gallery to commemorate the little subterranean venue that hosted early gigs for lots of big names.